Daisy and I took advantage of her spring break and one of my precious vacation days to spend the day birding in the Adirondacks. Normally students on spring break wear sunglasses to protect their eyes from the bright tropical sun in some place like Cancun. Not Daisy. She wore sunglasses to protect herself from going snow blind. It was a wonderfully warm day for the middle of March in the Adirondacks, meaning it got into the forties on the Fahrenheit scale. The sun was shining and the birds were most definitely out. Our first stop, at the Newcomb Visitor Interpretive Center, started nicely with a singing Brown Creeper in the parking lot. It got better when we got a look at the Purple Finches, American Goldfinches and Black-capped Chickadees participating in a feeding frenzy at the center’s amply-stocked feeders. When the woman working the counter told us Evening Grosbeaks had been visiting and were probably in the area it got even better! We stepped out on the center’s back deck, temporarily startling the frenzied flock. Evening Grosbeaks were nowhere in eye-shot or earshot. 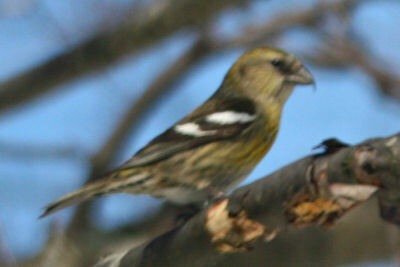 I spished for a second and no grosbeaks, but a Jeff Nadler popped out from under the deck with a howitzer of a camera. I had never met Jeff but had often salivated over his absurdly good bird pics (in fact, the only reason I hadn’t linked to his site yet is my fear you might go there and not come back!). While we were chatting I heard what sounded like a very large House Sparrow, which I had been told was what Evening Grosbeaks sound like. Binoculars to eyes and bingo, lifer! Well, a new bird on my life list anyway, as I have vague memories of seeing these brilliant big-beaked birds as a boy. The grosbeaks stayed distant though, so no pictures for you. Jeff was nice enough to give us an idea as to where to look at our next birding destination, the Sabattis Bog. On the ride there we spotted a Ruffed Grouse almost getting run over by the truck in front of us (not surprisingly it kept running so no picture) and a single Wild Turkey that we almost squished. Purple Finches were all over Circle Road and Sabbatis Road on the way to the bog, as well as a single pair of Red Crossbills and three pairs of White-winged Crossbills. The walk from the end of Sabbatis Road to the bog was a pleasure, with snow packed down by snowmobiles covering the difficult-to-walk-on railroad tracks. Several flocks of Black-capped Chickadees were never accompanied by a Boreal Chickadee, which I really want to get a good picture of, but were accompanied, each time, by a single Red-breasted Nuthatch. We listened to and watched three Blue Jays screaming at something, but couldn’t figure out what it was, and other than a Ruffed Grouse flushing from near the trail, that was it for birds at Sabbatis. 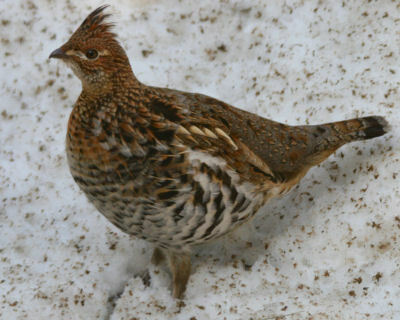 The flushed Ruffed Grouse nearly led to disaster though. Daisy was convinced a second one was nearby and, despite my warnings, walked off the hard-packed snow to try to flush another. The crust held her so I, dummy that I am, followed. Three steps later my right foot broke through and I was up to my thigh in snow. Getting that leg out led to the other foot breaking through and, of course, I soon toppled over, sacrificing my body’s dryness for my camera’s. Daisy somehow managed to recover from her laughter-induced paralysis to take my camera from me and watch me struggle out. Driving back out to Route 30 we spotted the same White-winged Crossbills in the road gritting. Gritting basically consists of eating dirt, which helps the crossbills digest their rather rough diet of cone seeds. Other than our third (unphotographed) Ruffed Grouse of the day, that was about it. So we, of course, headed further north, to Oregon Plains Road, which I had last visited last month. Oregon Plains Road was quieter, bird-wise, than last time. We saw four pairs of White-winged Crossbills, more Black-capped Chickadees (two flocks, each accompanied by a single Red-breasted Nuthatch), four Pine Siskins, a Common Raven, an unidentified accipiter, and then, glory of glories, a Ruffed Grouse that sat patiently on a snowbank while I inched the car up to it for pictures. After that marvelous experience we were pretty much done for the day. Well, done for the day except for a quick stop at Fort Edward so Daisy could ogle the Short-eared Owls on Fitzpatrick Road. Its nice to hear Daisy is doing well. 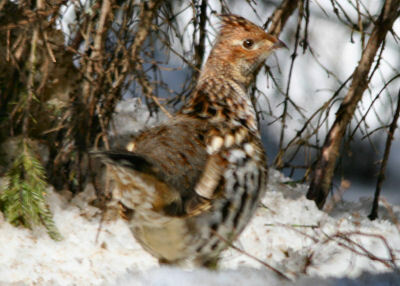 Love the Ruffed Grouse pic. Maybe you should hand the camera off to Daisy more often . . . Great Mute Swan Pic. also !!! have you ever heard of a duck called the “Muscovy Duck” it’s pretty damn hideous. it really does look inside out. google it. Danika–Daisy is loving being on spring break and when she starts carrying the clunker of a camera she can take as many pics as she wants…and thanks! 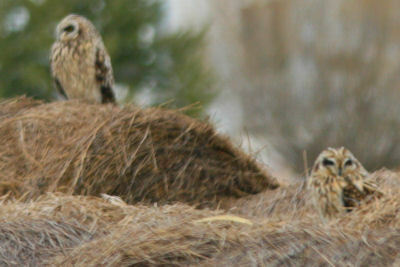 And eventually a couple more grouse pics will make their way to my flickr page. OooOOh feathers covering bird feet? i’ll take the grouse home too. he is a cute one. where else can i find one of these around NJ?? And no taking grouse home…they have enough problems with people shooting at them. the picture on the website you gave me above, the duck is not that bad looking. i guess the pic that i have, they caught the poor duck on a bad day. i’m gonna go look for this duck and give him some good whole wheat bread. ooooohhhhh i love short eared owls!!!!!!! Where Are You Birding this First Weekend of May 2009?